If you are thinking of bringing a deluxe home theater system into your home, then you are making a wise investment. Rather than going out to the movies or to a neighbor’s house to watch your favorite flick or catch the big game, you can stay warm and comfortable in your own home and have just as exciting of an experience! But wait, there’s more! In addition to enjoying the audio and video presentation that comes with a home theater system, you can bring in specialized furniture that is designed to enhance your viewing pleasure and keep you comfortable as you enjoy your movie lineup or get caught up on your current Netflix binge list. Home theater seating is built with longevity in mind, and our plush and cozy array of theater seating options will keep you relaxed for as long as you wish to stay. You can piece together various sizes and designs according to how small or large your living room or theater room needs to be. When it comes to planning for your home theater seating, you need to think about the primary use that you or your family will have in mind for this home theater. You can choose seating options that are meant for large groups or more intimate gatherings. For example, if you see yourselves having all of the guys come over to watch a ballgame, then keep in mind that they will want their space and room to spread out a bit. If you anticipate, however, that you will use the theater system for smaller occasions such as Friday night date nights or weekend movies with the kids, then couches or love seats might be more appropriate. At Audio Video Solutions, we want to help create for you a home theater seating arrangement that will best suit your needs. For many, that might mean a combination of the scenarios mentioned above. You will want a few seating options for those who want to stretch out and have plenty of comfortable space for themselves, and you can also incorporate a few couches or oversized chairs here and there to accommodate those who would rather cuddle up with someone while they watch. 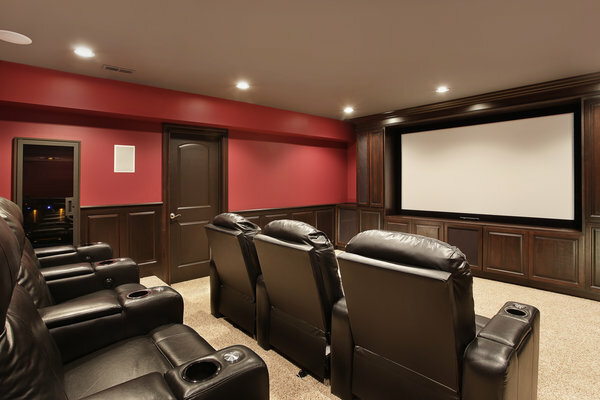 Your theater room should be customized to include all of the comforts that you have in mind, and our team of professionals can help you map out and place each seat in its proper spot so that everyone can see well when you’ve got a full house. Our top priorities are to deliver excellent customer service and to install your home theater needs with precise measure and care. We don’t mess around with products that are anything less than the best, and we want to walk away from each installation project knowing that this home theater setup has enhanced the value of your home. The quality time that your family and friends will spend gathered together enjoying this investment will be priceless! Call us today to learn more about our many home theater seating options and how we can help you indulge in your favorite pastime!